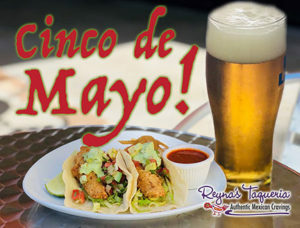 Cinco de Mayo - Tres por Cinco on May 5! • Reyna’s Taqueria - Authentic Mexican Cravings is located in the Sarasota Commons Center, 935 North Beneva Road, Suite 701, Sarasota, Florida 34232 • Tel 941.260.8343. Open seven days a week from Sun-Thu 11am-9pm and Fri-Sat 11am-10pm. Place the tomatoes in a Comal and roast until dark and charred completely, remove from the fire, and set aside. Roast the jalapeños, onions, and garlic then combine with the tomatoes, let cool slightly. Add the cilantro and purée with the immersion blender leaving it chunky enough. Season with salt, pepper, and lime juice. Let it completely cool down and store in the refrigerator.